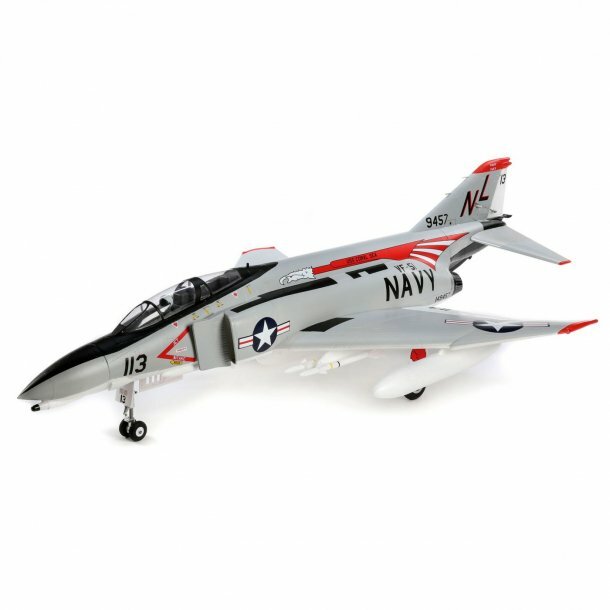 E-Flite F-4 Phantom II 80mm EDF BNF Basic.. BESTIL NU FOR LEVERING I APRIL. The McDonnell Douglas F-4 Phantom II is a legendary long-range supersonic interceptor and fighter-bomber that continues to serve in some countries more than 60 years after making its first flight. Capable of top speeds up to and even beyond Mach 2, the F-4 set numerous speed and altitude world records while serving the U.S. Navy, Marine Corps and Air Force. The E-flite® F-4 Phantom II 80mm EDF is an Extra Scale replica that delivers outstanding authenticity and incredible performance with fantastic handling- especially when it's equipped with exclusive Spektrum™ AS3X® and SAFE® Select technologies (BNF® Basic version only).